I’ve been very neglectful of my blog lately. I’ve been reading like crazy, but the motivation to sit down and write my reviews has been lacking. I’ve actually been reading magazines more than books. Anything I can get my hands on, from Time to The Atlantic, to In Style and Glamour magazine. A Tree Grows in Brooklyn, The Research Virtuoso, Mockingjay, and In the Shadow of the Wind. This month as been an odd month. I was let go from my primary librarian position, so I have more free time on my hands. Now I work only 3 days a week, something around 20-24 hours. Right now I’ve been reading more and crafting more. I’m working on 2 knitting projects, a cardigan and a pair of leggings. Yes, leggings. 80s style, big, baggy, over the jeans, leggings. It gets so cold during the winter and my normal sweatpants don’t always do the job. Besides, it seems like the 80s are making a comeback with some fierceness. Other news…I’m waiting for school to start at the end of September. I’ll be taking some community college courses on Child Development for a certification program. If its anything I’ve figured out during my short stint as a librarian, its that I like working with kids and that I want to really focus and put my energies towards becoming a children’s librarian. My birthday is also coming up at the end of September. The big 2-7. 3 years closer to 30. 7 months closer to my wedding. 7 months closer to my 2 week honeymoon in Europe. 7 more months until I get to celebrate the Festival of Saint Jordi in Barcelona. Lots of good things to look forward to, too bad the real good stuff is happening in 2011. At least I can look forward to the Fall TV season starting again this week! America’s Next Top Model, Gossip Girl, Supernatural, The Biggest Loser, etc. I can’t help myself. I’m so proud of these cute little baby booties I knit. I only have one foot done so far, but its absolutely fun to knit (slightly complex pattern though). I hate it when knitting patterns are written in paragraph form instead of bullet form. Bullets are so much easier to read. I came across this pattern by complete accident. My local library was giving away a few old magazines/booklets about knitting and baby project knitting. These little boots were in one of them! How one book can be depressing and inspirational at the same time, I don’t know, but Ann Hood’s semi-autobiographical tale definately fit into those two categories. The pace of the book was very even, the transitions from scene to scene, character to character, story to story was very smooth and fluid. Its an incredibly quick read. I started it on my lunch hour yesterday, and stayed up until midnight to finish it. The quick plot summary is that mother Mary Baxter lost her 5 year old daughter, Stella, to meningitis. At her mother’s urging, Mary takes up knitting and joins a Wednesday night knitting group with 5 other women. As the story progresses, these women go from anonymous knitters, to real people with real tragedies and struggles in their lives. Mary befriends these women, who know nothing about her recent loss and slowly is able to learn how to cope with the unexpected and much too early death of her daughter. I started this book yesterday on my lunch break and I was already teary eyed from the first few pages. The story hit pretty close to home for me. I lost my father to a heart attack when I was 20. A few weeks before, my mom had started teaching me how to knit. My boyfriend, for reasons we’ve both forgotten at this point, asked me to knit him a scarf. Although knitting didn’t provide the same meditative escape described in the book, it did provide a much needed distraction to everyone who came to visit. Throughout that first month, I would sit quietly and knit as relatives and friends came to visit. Everyone had their hands on the scarf, and even knit a few rows themselves, both the men and women. Then they would share stories of sweaters and socks their mother’s knit for them, or how they tried to knit, but failed. I stopped knitting for a while after finishing that scarf, took up crochet a few months later. Then 2 years ago, I started knitting again, and have not stopped since. 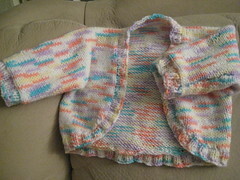 I don’t really like to buy books, especially knitting books because I can most of those same patterns online for free. But at Barnes and Nobel last night, this book caught my eye. 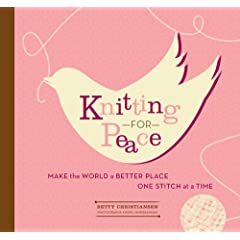 Knitting for Peace. So, its basically a guide to knitting charities across the US. 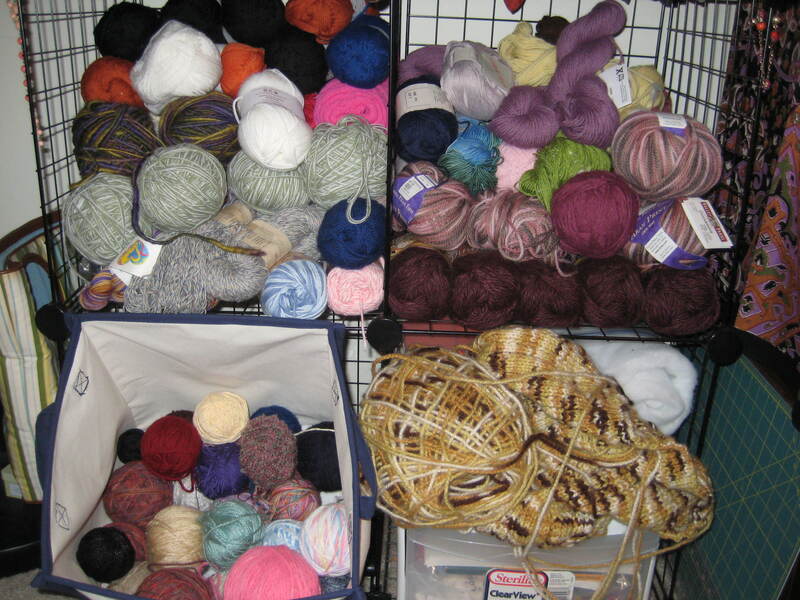 I’ve been wanting to donate a lot of the stuff I knit, and knit items specifically to donate for a while now. But other than the major groups like Project Linus, there are really too many charity groups to choose from. This book, will at least be a good starting off point. The patterns are pretty basic, mostly the essentials: scarves, hats, blankets, socks. The charities range from Afghans for Afghans (blankets for people in Afghanistan), blankets for animal shelters, Chemo hats, and slippers and beanies for soldiers in Iraq.